for allowing me to publish this data sheet. Thanks also to Bill Buhrmaster for the restoration photos. #60 seen here in the Houghton Yard in April of 1962. The Copper Range Railroad, the last major railroad built into the Copper Country of Upper Michigan, enjoyed a brisk, although short lived, passenger business that required some 30 passenger car over the years. Maximum trackage operated by the Copper Range never exceeded 150 miles but its passenger trains ran the gamut from the vestibuled "Northern Michigan Special" with the CR's own cafe-observation car to the lowly locals serving the various mining communities on the "Range". Considerable equipment was needed to handle the special weekend excursion trains from Calumet and Houghton to the Copper Range's own Freda Park, a beautiful natural park along Lake Superior. 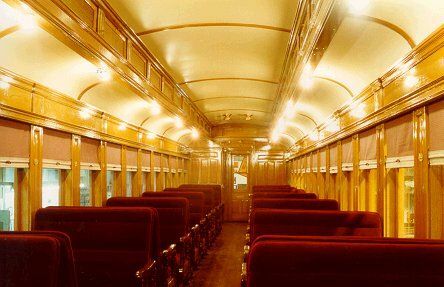 Coach #60 was built as a second-class coach in 1903 by the American Car & Foundry Co. (AC&F), in the Jeffersonville, Indiana works. The #60 was a typical open-platform car of the period. The #60 was one of six identical cars ordered by the five year old Copper Range R.R. under AC&F lot No. 2504. The coach was delivered in a color described as a green, brighter than Pullman green and striped in gold. 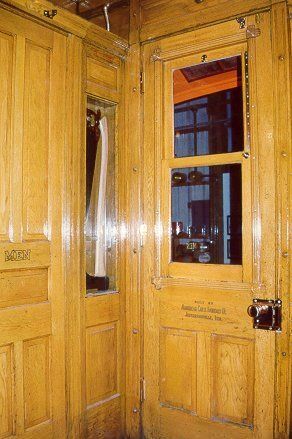 Starting in 1911 the Copper Range passenger equipment was gradually repainted in the standard "St. Paul" (Milwaukee Road) scheme of orange and maroon. This change took place after the "Northern Michigan Special's" inauguration as a premier Milwaukee Road passenger run from Chicago to Calumet. The "Special's" route included Copper Range trackage from McKeever to Calumet. Passenger service on the Copper Range dwindled to but a few mixed trains by 1930. The Copper Range Motor Bus Co. formed in 1928, plus the new family automobile both contributed to a dramatic decline in passenger business. A small roster of coaches endured the Great Depression and served the Copper Country on the well remembered school trains. The Copper Range, starting in 1908, carried school children to various area schools such as Painesdale from remote mining settlements of Redridge, Beacon Hill, Freda, Atlantic and South Range. Most of the school train service was replaced by busses in 1941. Surplus coaches such as sister cars #55, #57 and two others, went to Mexico in 1944. 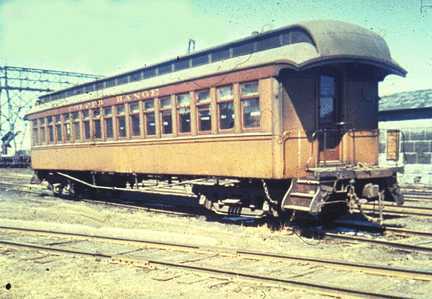 The last hurrah for Copper Range passenger service came in June 1, 1944 when a first class passenger train was re-instituted from Houghton to McKeever for a connection with the Milwaukee's Chippewa" to Chicago. World War II gas rationing made such service a necessity. The train consisted of Copper Range 2-6-0 #58 with wooden combination car #26 and coach #60. Both cars were completely refurbished for the new train. Unfortunately, the last vestige of Copper Range passenger service ended abruptly on September 15, 1946. Coach #60 went into storage in the Houghton roundhouse. In 1965 coach #60 literally got a new lease on life and spent two seasons on the newly formed tourist line, the Marquette and Huron Mountain. The startup of a tourist railroad at Calumet , Michigan in 1967 resulted in Copper Range 2-8-0 #29 and coach #60 being sold to the Keweenaw Central Railroad. 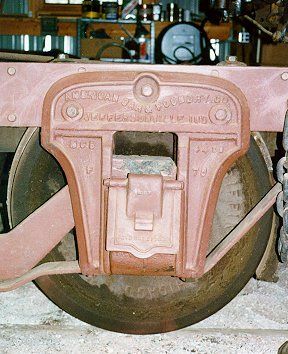 The total abandonment of the Copper Range Railroad became a reality in 1973 which, in turn forced the Keweenaw Central to discontinue operation rather than face the loss of their rail connection. 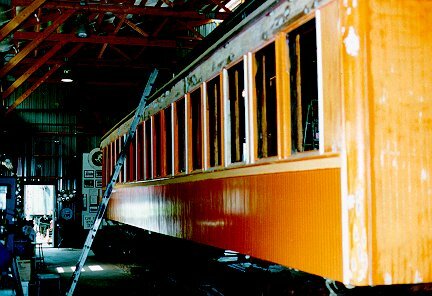 Coach #60 left the Copper Country for all times in December 1972 and was stored at the Wells, Michigan shop of the Escanaba & Lake Superior R.R.. The American Car & Foundry Co., of Jeffersonville, Indiana had its beginnings as the Ohio Falls Car Co., being established during the Civil War. Ohio Falls endured several bankruptcies and the Panic of 1873 to become a major Midwestern car builder. Early on the firm promoted use of Southern Yellow pine for car construction due to its superior strength. By the 1890's Ohio Falls' volume had reached $3 million worth of cars annually. In 1899 Ohio Falls was consolidated into the industry giant American Car & Foundry Co. (ACF). The Jeffersonville plant was closed by ACF in 1945 although most of the buildings survive, utilized for a variety of industrial and commercial purposes. 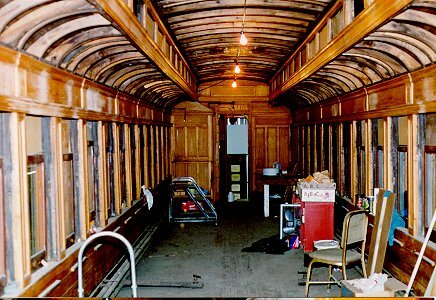 The interior of the coach was originally stained and varnished with a Golden Oak finish. In addition to solid oak woodwork, the car was had with oak veneer headlining and ceiling panels. The seats were upholstered with cane (rattan). Heat to the car was provided by steam, while lighting was provided by four (2) burner kerosene lamps mounted on the ceiling. Electric side lights were added to the car by World War I. During the 1944 rebuild, the oak veneer ceiling panels were replaced with painted panels and the rattan seats were changed to red plush. 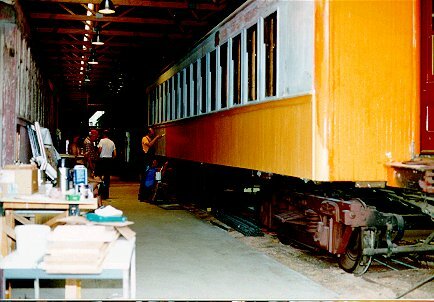 The Mid-Continent Railway Museum (MCRM) purchased the car in 1982 and arranged to have it moved to North Freedom in September 1982. While awaiting restoration, a new roof was installed in 1984. Starting in 1993, museum volunteers focused their efforts on performing a complete restoration.. 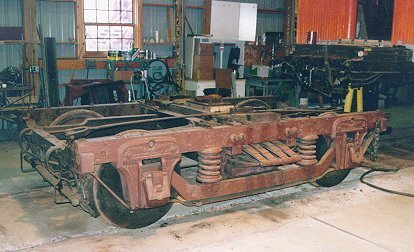 The car is being restored to the appearance that it had during the passenger service period of 1944 to 1946.